Today I worked ten hours, went home to the Morro Bay house, packed up my computer and weekend bag, and got back in the car to drive the 150 miles (two and a half hours) back down to the Ventura homestead, where I am now typing this blog entry. Tomorrow Sean and I have to get up early to run 11 miles for our half marathon training, and then we are going to get in the car and drive another 150 miles to Redlands to visit some old friends. 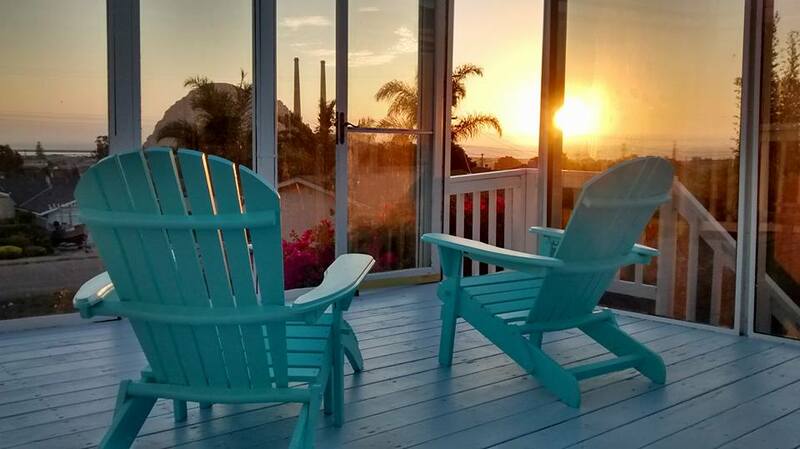 I didn’t make any further progress on the sock, so tonight I present to you the image of a beautiful sunset view from our newly painted deck and newly painted deck chairs in Morro Bay. Categories: Adventures with Sean | Tags: home improvement, Morro Bay | Permalink. I know first hand how awesome your view is!!! Love it!!! You guys painted the deck too?! I know you and Sean are enjoying it in between travels!! Btw cuzz I enjoy reading your blogs!